Leonard Mizzi was born in Kirkop on May 15, 1941. He began his career with his hometown team in the MAFA league before joining Żurrieq Minors in 1957. In his first season with Żurrieq, Mizzi helped the team win Section D of the Minors League. Mizzi was too good a player to stay in the third division and, at the tender age of 17, he signed for Hibernians. His first division debut came on December 7, 1958 in the 3-1 victory over Birkirkara. Mizzi spent only one season with the Paolites as, in 1959-60, he joined Floriana where he had the distinction of playing alongside legendary players of the ­calibre of Lolly Borg and Pullu Demanuele. The Kirkop-born player made his debut for the Greens on March 19, 1960 in the 6-1 victory over Ħamrun Spartans. However, he did not settle at Floriana. His roving spirit took over once again and in 1960-61, he moved to St George’s. This time, his stay lasted longer and, after making his first appearance for the Saints on October 8, 1960 in the 0-0 draw against Ħamrun Spartans, he made the centre-half position his own. Mizzi enjoyed three good seasons with St George’s during which he made 48 first-team appearances in the top division of Maltese football. He was very happy at St George’s and would surely have ended his career with the Cospicua club but circumstances dictated otherwise. In 1963-64, Valletta lost their star centre-half Joe Cilia who emigrated to Australia. Cilia left a big void in the City ranks which, at the time, seemed impossible to fill. Valletta looked around for a suitable replacement and their choice fell on Mizzi. The Citizens paid a record fee of £500 for Mizzi’s services. There is no doubt that, at the time, he was the best available replacement for Cilia. Valletta, however, came to regret the money they paid for Mizzi because he only played 17 league matches in the club’s colours in three uneventful seasons. A rift developed between the club and Mizzi who decided to retire. A year of inactivity followed after which Mizzi was approached by Birżebbuġa St Peter’s and he decided to make a comeback with them in the third division. The Saints were building a team around veterans like Mizzi and Louis Theobald, of Hibernians, at the time. With the Saints, Mizzi won the third division cup in 1968-69. 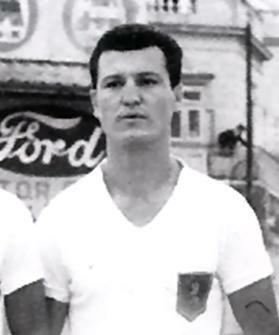 Mizzi stayed with Birżebbuġa until 1972-73 when he returned to where he started and joined Kirkop United. However, by now, age was catching up with him and midway through the season he hung up his boots. There is no doubt that Mizzi was a fine footballer. Tough, strong and fair in his tackles, he was an excellent defender. However, his inability to settle with a top club cost him dearly in terms of honours, both at club and international level.